Tinytag Plus 2 and Ultra 2 ranges provide affordable temperature and humidity data logging solutions for both outdoor and indoor applications. The ranges have faster download time, improved data integrity, low battery monitor and larger memory functions ideal for long-term data collection. The improved resolution (16 bits) makes the data analysis far more accurate and gives smoother graphs when using Tinytag Explorer Software. 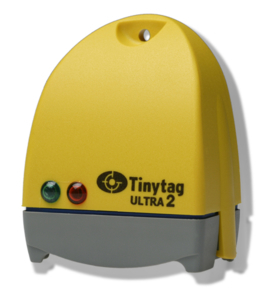 Tinytag Plus 2 range is often used outdoors. The loggers in this range are very effective in harsh environments thanks to its ragged waterproof (IP68 rated) casing. They are suitable for use in damp or wet environments and can be left out in the rain, buried in soil etc. Their robust design means it's perfect for a wide range of applications within a variety of industries such as food, agriculture, logistics and composting. The splash-proof Tinytag Ultra 2, a cost-effective alternative, is commonly used for monitoring conditions indoors or outdoors under cover. The range is ideal for monitoring the environment in museums and galleries as well as in laboratories in assisting medical professionals in the healthcare industry. Data from both ranges can be downloaded via USB or serial cable to the Tinytag Explorer software which can create graphs and tables and then be exported into MS Excel and Word for further analysis and validation purposes.